Scaling Ventures is for startup founders and senior leaders who have achieved product-market fit and now need to successfully guide their company through cycles of rapid growth and organizational change. Shikhar Ghosh is a Professor of Management Practice in the Entrepreneurial Management Unit at Harvard Business School. He has been the founder and CEO or Chairman of eight technology-based companies, and has been named one of the “Best Entrepreneurs in the US” by Businessweek and one of the “Masters of the Internet Universe” by Forbes. Jeffrey Rayport is a Senior Lecturer of Business Administration in Entrepreneurial Management at Harvard Business School, and an expert in digital marketing services, online media, and e-commerce. Rayport has founded three companies and served on nearly 20 public and private corporate boards. A three-time winner of the Outstanding Professor Award at HBS, Rayport coined the term "viral marketing." You’ve achieved product-market fit and received Series A or higher funding in the past three years. Learn how to effectively navigate your venture through rapid growth cycles and take your company to the next level. You work for a company experiencing a rapid growth phase and grapple with questions like, “How do we attract and retain top talent?” Gain the skills and knowledge needed to tackle these issues as they arise. You see the potential in developing a common language and framework to discuss challenges related to scale. Attend together to make sure your organization is prepared for rapid growth. Companies that send five or more individuals are eligible for a five percent discount. Contact hbsonlinealliances@hbs.edu for more information. Growing a company is a full-time commitment. That’s why this program is tailored to meet the needs of busy startup founders and senior leaders. Scaling Ventures is an eight-week course offered via our real-time, interactive online classroom, enabling you to solve the biggest challenges facing your business without ever leaving your desk. After connecting from a computer anywhere in the world, you can interact with faculty members and peers live—just like you would in a Harvard Business School classroom. Applications are reviewed on a rolling basis. Scaling Ventures has a limited number of seats available, which will be allocated on a first-come, first-serve basis to accepted applicants who enroll and pay. Learn from real decisions made by real companies through case studies specifically selected because they resonate across industries and geographies and simulate the types of challenges and difficult conversations you’ll face at your own company. You will also have the opportunity to discuss any current issues facing you and your team and problem-solve in real-time with faculty and peers during class and in between sessions. This is the closest you come to experiencing a Harvard Business School classroom without actually being there. Participants can interact with each other while being part of the case discussions with faculty. I can't say enough about the energy and motivation I gained from taking this course. I felt a renewed commitment to my life-long pursuits and left each class with introspective thoughts and ideas for my future. 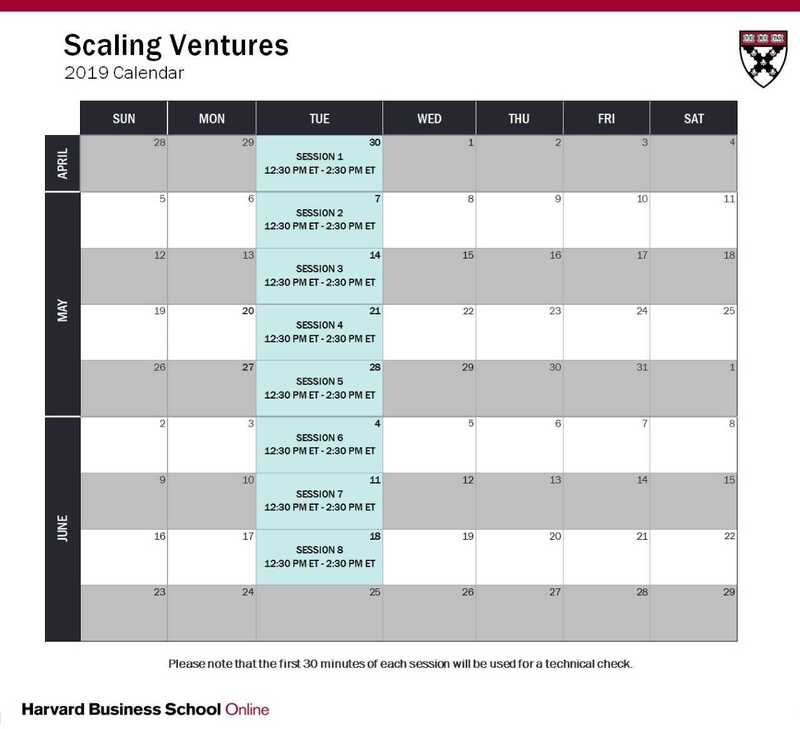 Enroll today in Harvard Business School Online’s real-time, interactive course Scaling Ventures.